microBEnet journal club: MetaBAT for reconstructing single genomes from complex microbial communities – microBEnet: the microbiology of the Built Environment network. 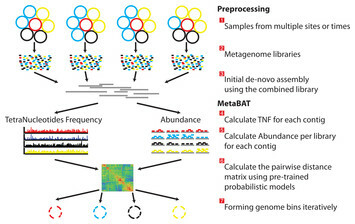 A typical metagenome experiment may contain many spatial or time-series samples, each consisting of many different genomes (different color circles). Each sample is sequenced by next-generation sequencing technology to form a sequencing library with many short reads. For each contig pair, a tetranucleotide frequency distance probability (TDP) is calculated from a distribution modelled from 1,414 reference genomes. For each contig pair, an abundance distance probability (ADP) across all the samples is calculated. The TDP and ADP of each contig pair are then combined, and the resulting distance for all pairs form a distance matrix. Each bin will be formed iteratively and exhaustively from the distance matrix. So – basically what MetaBAT does is to carry out post-assembly analysis of metagenomic data sets and then bins the contigs from the assemblies using a variety of pieces of information about the contigs. Not 100% sure how useful this is / will be but seems worth trying out for those trying to assemble / bin metagenomic data.